The Trump administration has stepped up its efforts to expand the controversial 287(g) program, which gives state and local law enforcement agencies limited immigration enforcement authority. Shortly after his inauguration, President Donald Trump signed an executive order instructing then-Secretary of Homeland Security John Kelly to pursue additional 287(g) agreements. The president’s guidance was based on a section of the Immigration and Nationality Act that authorizes U.S. Immigrations and Customs Enforcement (ICE) to enter into partnership with local and state law enforcement agencies to target and apprehend undocumented residents. Last July, Thomas Homan, acting director of ICE, said that, by the end of the year, he expected to triple the number of 287(g) agreements nationwide. In sum, 47 of the 76 current 287(g) agreements were signed after President Trump took office. Since its implementation in 1996, the program has been the subject of controversy, including allegations of racial profiling that were borne out by Department of Justice (DOJ) investigations in counties such as Maricopa and Alamance. In part because of such problems, in the past decade, at least 35 287(g) agreements with state and local jurisdictions have been terminated or not renewed. Local and state officials frequently cited a degradation of trust in the community; a drain on agency resources; advocacy efforts from both local immigrant rights groups and national organizations; and court rulings as reasons for ending or exiting the program. ICE also chose to end agreements—most prominently in cases where the DOJ concluded that local officials used their delegated authorities to engage in unlawful discriminatory policing practices. Earlier reports from the Center for American Progress highlight the pernicious effects that 287(g) programs can have on communities, as local residents lose trust in the very law enforcement agencies that are responsible for maintaining public safety. When factors such as fear and distrust prevent immigrant residents from contacting or speaking to local law enforcement officers newly deputized under 287(g) programs, cooperation can break down, leaving victims and witnesses reluctant to step forward. In Framingham, Massachusetts, police Chief Steven Carl echoed these concerns and pushed to abandon the department’s 287(g) agreement after ICE requested an expansion of its cooperation. Carl noted that witnesses in the local Brazilian community were reluctant to provide information to police. Participation in the 287(g) program runs counter to law enforcement best practices, which include community policing—a strategy that involves working cooperatively with residents to both identify issues and seek assistance in addressing them. Implementing a 287(g) agreement can be extremely costly for both state and local law enforcement agencies. Participating departments receive training from ICE but self-fund most expenses, including travel, housing, per diem for officers during training, annualized costs that result from administrative demands, and increases in personnel expenditure. Harris County, Texas, Sheriff Ed Gonzalez terminated the county’s 287(g) agreement in February 2017 due to limited departmental resources, stating that it cost the sheriff’s office an estimated $675,000 in salaries alone. Activism can also play a key role in motivating officials to reject 287(g) agreements under consideration. In Berks County, Pennsylvania, protesters marched to express their opposition to a 287(g) agreement under consideration by county commissioners. Adanjesus Marin, director of Make the Road Pennsylvania, expressed community concerns that entering into the 287(g) program would lead to racial profiling by the county sheriff’s office. As of now, Berks County does not participate in the 287(g) program. Another Pennsylvania jurisdiction, Bucks County, elected not to enter into a 287(g) agreement after a broad coalition—which included the Bucks County NAACP, Make the Road Pennsylvania, and the Pennsylvania Immigration and Citizenship Coalition—spoke out during public meetings and started a petition. Activists in both counties mentioned how the fear brought on by 287(g) agreements can negatively impact participating communities. Legislative and judicial actions affect decisionmaking as well, prompting two different jurisdictions to withdraw from 287(g). In May 2014, the San Bernardino County, California, Sheriff’s Department terminated its agreement after a federal judge in Oregon ruled immigration detainers unconstitutional, thus calling into question procedures instituted under the program. In 2017, the California Values Act was passed, limiting the ways in which law enforcement agencies in the state can cooperate with federal immigration enforcement. This prompted Orange County Sheriff Sandra Hutchens to end the department’s 287(g) agreement. 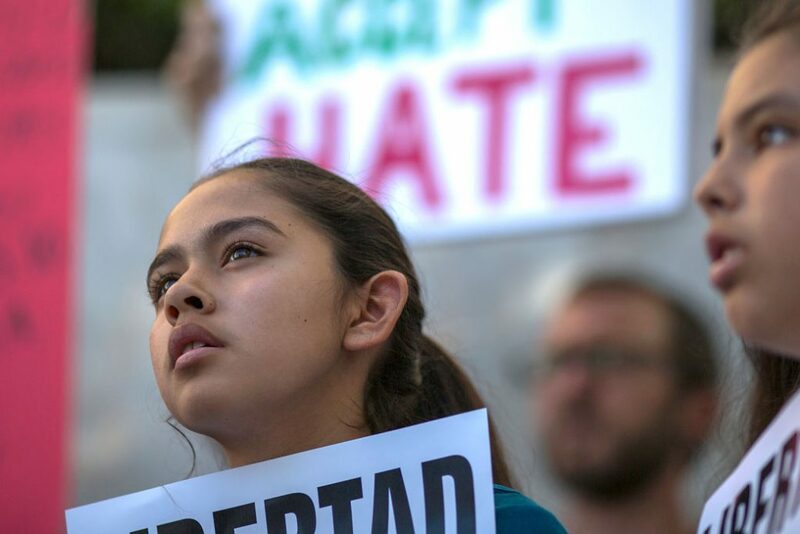 Actions such as awareness campaigns and coalition building by nonprofits, law enforcement officials, and other activists played a key role in marshalling support for the passage of the bill, which is now the target of a lawsuit by Attorney General Jeff Sessions that would block its protections for immigrant communities. ICE terminated several 287(g) agreements with state and local law enforcement. In December 2011, the Department of Homeland Security ended the Maricopa County Sheriff’s Office 287(g) agreement after the DOJ confirmed patterns of racially discriminatory police and jail practices that targeted Latino residents and inmates. A DOJ investigation into the Alamance County, North Carolina, Sheriff’s Office yielded similar results, prompting the federal government to withdraw its 287(g) authority. In June 2012, when the U.S. Supreme Court struck down much of Arizona’s controversial S.B. 1070—an anti-immigrant bill—ICE voided 287(g) task force agreements with agencies in the state. Some Arizona departments continued 287(g) participation under different models, but the Arizona Department of Public Safety, the Phoenix Police Department, and the Pima County Sheriff’s Department elected to discontinue all 287(g) activity. And in December 2012, ICE canceled its contract with the Herndon, Virginia, Police Department, as part of a move away from so-called task force agreements, which specifically deputized officers to inquire about the immigration status of individuals stopped during routine policing and to make arrests based solely on federal immigration grounds. The experiences of local law enforcement agencies that ended their 287(g) agreements should help to inform communities and agencies that continue to participate in the program as well as those that may consider joining in the future. In addition to the immense human costs to immigrant families and economic costs to communities, law enforcement agencies themselves have often found that signing 287(g) agreements makes maintaining public safety more difficult. Officers have reported less cooperation from fearful immigrant residents, regardless of status. Furthermore, advocacy efforts—such as widespread protests aimed at halting discriminatory policing practices—interrupt day-to-day law enforcement activities that are required to keep communities safe. Finally, departmental budgets become mired in uncompensated costs and legal fees. In contrast, counties and cities that reject divisive programs such as 287(g) and instead encourage cooperative community policing may well find a greater reduction in crime, as well as other benefits, as they foster efficient and equitable outcomes for all residents. Anneliese Hermann is an intern for the Immigration team at the Center for American Progress. *Correction, April 4, 2018: This column has been updated to include the title of Adanjesus Marin, which it had initially failed to include.